SwimovateUSA, the American division for the original makers of the automatic lap counting swim watch, has launched their website for U.S. sales and dealers. Brad Sorock, spokesman for SwimovateUSA, says: "We are very eager to get our website out to the American public. 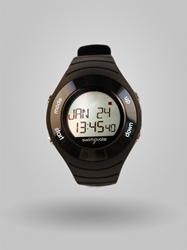 The Swimovate's revolutionary PoolMate watch has taken over the U.K. swimming and triathlon scene, and we're sure it'll have the same kind of traction here in the U.S."
Swimovate is the company that created the revolutionary PoolMate watch, which allows swimmers to accurately count the number of laps, distance, calories, strokes, and other important measures of their swim, so they can focus on their swimming while they collect data for training purposes. The PoolMate line includes several watches, including the PoolMate Pro which features PC-link ability to upload and graphically analyze swimming data over long periods of time, and the PoolMate HR, which has all of the features of other PoolMates, plus an included chest-strap that makes it the first swimming watch that accurately counts heart rate underwater. The new website will allow individual purchasers and dealers alike to explore the different models of the PoolMate, and learn more about how these watches can take their swimming to the next level, as well as offer direct-to-consumer rates on all of SwimovateUSA's products.